Office: Unit 7/25 Work West Complex, 310 Glen Road, Belfast BT11 8ER. Lawell Asphalt Company Limited was formed in 1974; a smooth run and well capitalised business which places a strong emphasis on professional management and administration systems and ensures a hig level of continual training accepting all responsiblities under CDM Regulations. 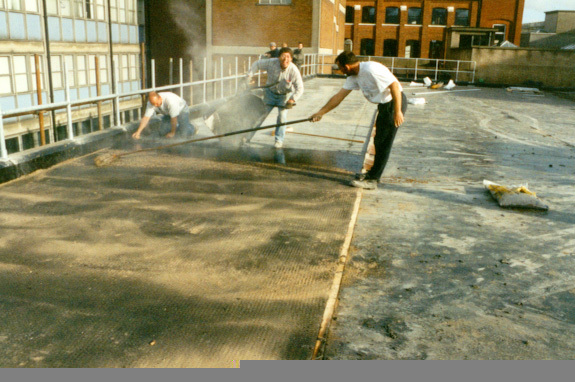 The Company specialises in projects incorporating Mastic Asphalt, Built-Up Felt, Single-Ply and cold applied Spray-On specifications to Roofs, Floors, Foundations and Bridge and Carpark decks. Working closely with material manufacturers such as Permanite, Ruberoid, Vulcanite, Sarnafil, Grace Products etc has ensured high standards are consistently maintained, resulting in a great deal of repeat business as well as high recommendatlions from main contractors and clients alike. All operatives have attained a high standard of workmanship with first class technical ability and all with a minimum of 15 years experience. Every employee is fully conversant with current health and safety regulations.